What do you think the Wise Men packed when they headed out to follow the bright star? Hoping on a camel to travel wasn't like road trips these days. Not only were camels lacking radios, seatbelts, and air conditioning; the wise men weren't even traveling along actual roads. Their epic journey wasn't mapped. They were simply following the star. Where would they have stopped along the way? There were no gas stations where they could have stopped to grab a slushie and a glazed donut. There was no gas! What are we saying? We're saying that you'd have to be a pretty confident king to rely on astronomy as a trip advisor back in the day. Lucky those wise men took their chances though, otherwise, your child wouldn't have gotten the part of the Wiseman in your church's nativity scene. While we can't imagine riding a camel in this costume, we can imagine it looking awesome in a stable. 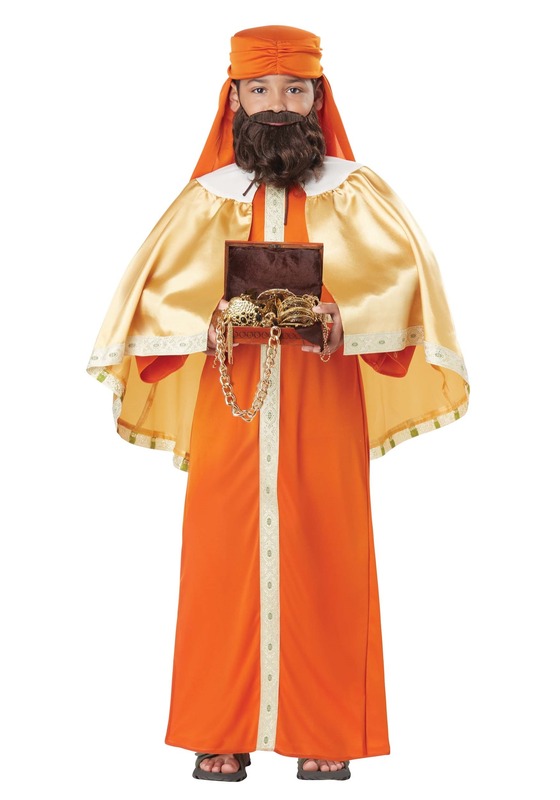 The robe is a fresh orange color and has an interior trim that matches the gold cloak around his shoulders. The gold cape ties with a satin cord at the neck so you'll know it will stay in place while your child stays in character. The whole thing is topped off with an orange cap with ruching on the front and draping fabric down the back. All your child needs to complete this outfit is a box of treasure and a beard! The three kings traveled a long way to find the holy family in the stable. Now that they're finally there together, we bet they're really glad they get to unload all that heavy Frankincense, Mhyrr, and gold. And we bet that this is the first time these kings have ever stayed in a stable. Maybe they'll be able to hook Mary, Jesus, and Joseph up with some room service.